Open games are well known to lead to sharp positions. Whenever there is a sharp position, we have many tactical opportunities as well! In this 4th Volume of his Tactics series, FM Valeri Lilov focuses on tactics found in the open games. 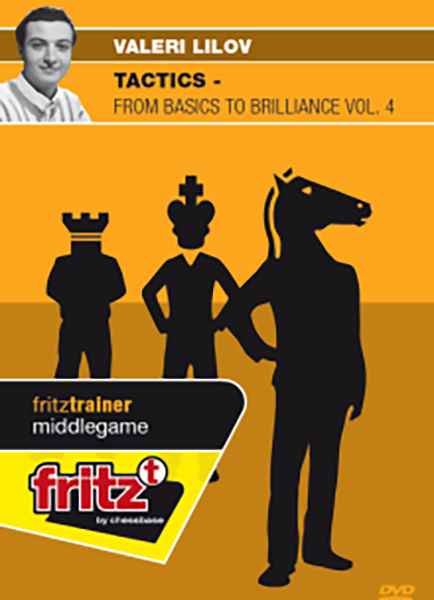 Some of the basic questions this DVD seeks to answer are how tactics arise in open games and what you can do to avoid falling prey to early tactics after 1.e4 e5. In his instructive themed lectures, the author also takes the time to explain a number of tactical methods and techniques you can use to exploit your opponent’s mistakes, the ones most commonly seen in the open games. For this purpose, the FIDE master has carefully selected many instructive games and positions played in openings like the King’s Gambit, the Vienna Game, and the Two Knights Defence among many others. While open games abound in tactics, we never know who will see them first and thus gain a decisive advantage! So why not use Lilov’s step-bystep approach to creating and finding powerful tactics in your own games by fearlessly placing your pieces in sharp positions? You are on the way to your next magnificent win!